The Guide is an ideal resource for managers and recruiters and focuses on the critical areas necessary for hiring the right people. Behind The Wheel gives you the information you must have to take a long-term perspective on your organization to anticipate and respond to emerging industry, customer and competitive forces. It is unique in that it links recruitment best practices directly to the National Occupational Standards. National Occupational Standards describe the knowledge, skills, abilities and attitudes necessary for competent performance in a specific occupation. Occupational Standards can be used for a variety of purposes. They may form the basis for training, curriculum development and accreditation of training programs, recruitment, performance improvement, career development and certification of practitioners. By creating and promoting these Standards, the bus industry will improve its customer service delivery and subsequently increase profitability, job satisfaction, and opportunities in all sectors. Standards can guide your career and development, provide motivation to learn new skills, contribute to personal achievement and enhance public and professional image. Standards will help improve your bottom line by providing guidance for recruitment, training and development of staff, identifying key tasks and roles, ensuring that employee skills are effectively utilized, helping to create a competent, flexible and motivated workforce and helping to promote the industry as a viable career choice. Standards provide nationally recognized industry-driven benchmarks of best performance and provide the means for making better use of national resources. Standards provide the basis for curriculum and training development and identify areas where expertise is required. Standards are developed and validated by people with extensive knowledge and experience in bus operations. Subject matter experts are recruited from across Canada in all sectors of our industry. These experts participate in a formal job analysis process. Following several days of data gathering, a draft standard is produced. The standard is then sent to a larger group of subject matter experts and other stakeholders for validation. Bus Operators represent 70% of our industry's workforce. Every day, thousands of professional Bus Operators are responsible for the safe transport of millions of Canadians. In order to successfully deliver this service, a Bus Operator needs to be knowledgeable about driver-related mechanical systems, scheduling, safe driving practices and road regulations, interpersonal skills, special needs passengers, and, in the case of Tour Bus Operators, sightseeing information. 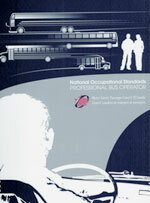 To download your copy of the National Occupational Standards for Professional Bus Operator, simply Click Here. Bus Operator Training Instructors are typically experienced bus operators with additional training and skill in instructional delivery techniques. In some jurisdictions they also require certification in adult education and training, and specialized training in human rights legislation, air brakes and special needs. They are responsible for developing and delivering training programs which train learners to operate vehicles to company and regulatory requirements. They deliver driving, bus operating and passenger relations training as well as emergency procedures and company policy instructions to new employees; they also provide upgrading training to existing employees. They accomplish this by delivering instruction both to groups of students in a classroom setting and to individual learners in workplace simulations and on the road situations. 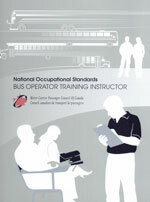 To download your copy of the National Occupational Standards for Bus Operator Training Instructor, simply Click Here. Mechanics and maintenance staff represent 7% of our industry's workforce. They inspect, troubleshoot, repair, replace and maintain operating systems and components. By providing their specialized knowledge and skills our industry is proud to offer safe, secure and reliable transportation to millions of Canadians daily.